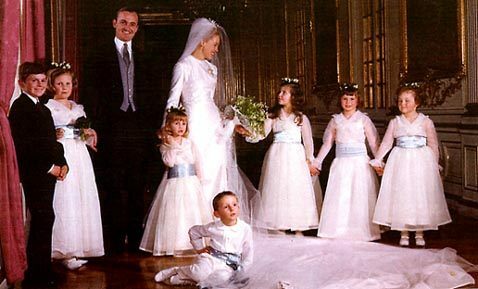 On January 24, 1967, His Royal Highness The Prince Max, younger son of His Majesty King Albert, married Countess Elisabeth Douglas. Princess Max was born into a branch of the Scottish house of Douglas which had settled in Sweden in the seventeenth century. She is descended in the male line from William Douglas, 4th of Whittinghame, who married Elizabeth Maitland, herself a descendant of Robert II, King of Scots. Wedding of Prince and Princess Max, January 24, 1967. Gabrielle Waldburg, Marianne Quadt, and Monika Waldburg. This page is maintained by Noel S. McFerran (noel.mcferran@rogers.com) and was last updated September 2, 2006. © Noel S. McFerran 1997-2006.